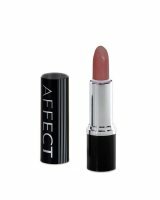 LONG WEAR CONFIDENCE LIPSTICK by AFFECT. Matte lipstick. It is an excellent combination of hybrid pigment and matting powder. The product ensures intense color and matte effect. Despite its finish, it does not dry skin. Creamy formula spreads easily. Lipstick is available in 12 different colors, so everyone will find the perfect shade for them. It does not dry lips. - INSOMNIA - dirty pink with brown notes.